As the expert in client and community needs, your nonprofit has an important role to play in informing good public policy. At DBC, elevating the voices of everyday people to educate legislators is essential to our work. We can help your nonprofit make an impact on state and federal budgets and laws that impact your community. Washington needs you! Here are some resources to get you started. On the menu or at the table: Why nonprofit advocacy is more important than ever. 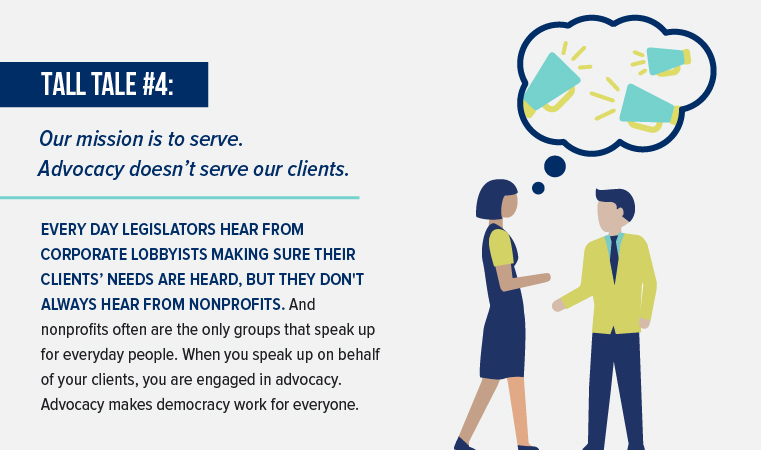 Nonprofit advocacy amplifies the voices of the people you serve. Think about it. After the crowds have gone and the cleaning crew is done making the capitol building beautiful it’s just a small group of legislators working through the night hammering out the details of what could be next year’s budget. Everything is on the table now, and they are trying to decide which services and programs to cut, which to keep at last year’s funding levels, and which to grant additional funding. If they haven’t heard from you or the people in your neighborhood, then the funding your community relies on to put food on the table or educate their children could be cut. Your nonprofit has a chance to make democracy work for all the people. Legislators have tough decisions to make on hundreds of issues. They rely on experts to tell them how their funding and policy decisions will play out. In your community or issue area, you are the expert. You know better than anyone how new public policies will impact everyday people. And if you don’t, you have access to the people who do know: the people that come to your nonprofit for assistance. In recent years, policymakers at all levels (federal, state, county, municipal) have responded to tough economic realities by decreasing funding and tightening budgets for nearly all programs and services. When public officials or bodies propose to reduce or cut funding for critical programs and services, your role as a nonprofit advocate is to educate them about the real effects of tightening those purse strings. Put a human face on those dollar signs. Bring the budget numbers off the page with a personal story about the real-life effects of those decisions. Even when your nonprofit isn’t impacted by decreasing public budgets, your community or clients often are. Policymakers need to hear your clients’ personal stories, your agency’s results, and your community’s concerns. They need to see the statistics and reports you’ve generated that demonstrate the importance of the programs they are funding. 2. Who knows about our issue? 3. Who else needs to know about our issue? 4. Who supports us and why? 5. Who opposes us and why? Our experienced policy advocates can help you identify simple ways to make change happen. Contact our team to take your seat at the table and speak up on the issues that impact the people you serve. 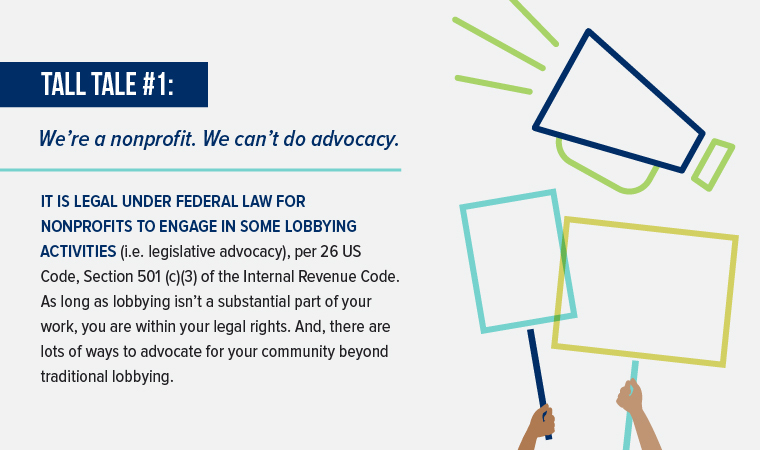 Nonprofit advocacy is NOT illegal. Learn more about the advocacy tall tales that may be hurting your mission in our slides at the top of the page. Calling legislators can feel daunting when you first start, but a little practice goes a long way. Remember, legislators are there to represent you and your community. Responding to calls from the public is a big part of what they do. They actually need to hear from the community to know how they are doing at their job. Download our 10 Tips for Calling Legislators in pdf form here. 1. Find your senators’ and representative’s phone numbers on their websites or by calling the U.S. Capitol Switchboard at (202) 224-3121 and requesting to be connected to their offices. You can find your state legislators at https://openstates.org. It may also be found at your state board of elections site. 2. Prepare a script – word for word – so that you make sure to remember everything you want to say. You also may have to leave a message with staff or on voicemail so it will help to have a script in front of you. Download our sample script below! 3. Remember that the legislator’s staff will be answering the phone and taking note of your concern. They may be distracted by other calls, visitors or legislative responsibilities and may need to put you on hold or ask you to repeat yourself. 4. On the phone, introduce yourself and identify yourself as a constituent by giving the name of your hometown. Be prepared to give your full name, mailing address, email address and phone number (include this information in your script). If you aren’t a constituent, share very briefly how you are connected to their district or represent people who may live in their district. 5. Ask to speak with the staff person who handles the issue about which you are calling. 6. Once connected with the staff person handling your issue, state the reason for your call, i.e. support or opposition for a bill, concerns about funding for a program, etc. 7. Be clear about what you’re asking. Ask for your senators’ or representative’s position on the issue and a written response with his/her views on your issue. 8. Thank the aide for his/her time and indicate that you appreciate his/her willingness to listen to you and record your comments. Be sure to record the name of the staffer and the day and time you spoke, so you can have it for future use and in case you need to follow up. 9. Keep in touch with your legislator’s office to establish and build a relationship. Offer yourself as a local resource on issues. 10. Remember the “B’s”: Be polite, Be brief, Be clear about what you’re asking. DBC also provides staff and board advocacy training for nonprofits. Contact Laura at lstudee@duganbassett.com to learn more. Download our sample script here! Hello, my name is [YOUR NAME]. I am [REPRESENTATIVE/SENATOR] [NAME]’s constituent from [HOMETOWN or DISTRICT]. I am calling today about [ISSUE/BILL NO.]. I [SUPPORT/OPPOSE] this [BILL/ISSUE] because [STATE A FEW BRIEF REASONS]. What is the [REPRESENTATIVE/SENATOR]’s stance on this [BILL/ISSUE]? What is he/she doing about this [BILL/ISSUE]? Thanks for your time. I would like a written response with more information on the [REPRESENTATIVE/SENATOR]’s position on this [BILL/ISSUE]. My contact information is: [MAILING ADDRESS, EMAIL ADDRESS, PHONE NUMBER]. May I have your first and last name for my records? Thank you for recording my concerns and seeing that I get a response from [REPRESENTATIVE/SENATOR] [NAME]. Now pat yourself on the back! You've done your civic duty!